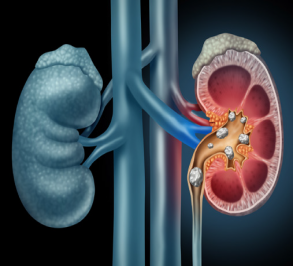 How and why do kidney stones form? If you need tests or treatment for a stone, what’s involved and what are the risks? 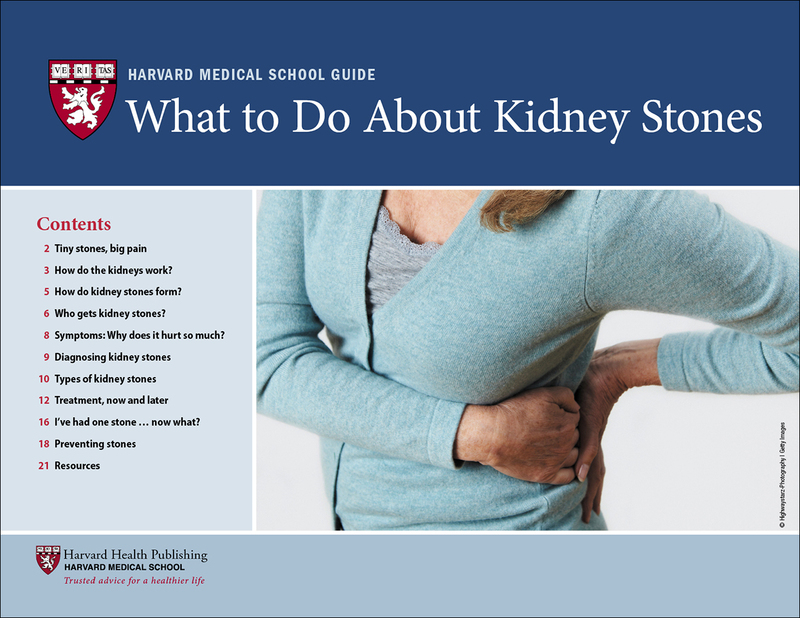 Who is likely to develop a first (or second or third) kidney stone, and how can it be prevented? What to Do About Kidney Stones will answer all of these questions. We’ll also bust some myths about why kidney stones hurt so much and how to reduce your risk. Your kidneys are an amazing blood purifier! Each one has about one million tiny filtering units that help whisk toxins out of your body to help keep you healthy. But for more than 600,000 people each year, [something goes painfully wrong. Tiny crystals can build up inside the kidneys to create a small stone that cause excruciating pain you wouldn’t wish on anyone. What can you do to help prevent this dire situation? How can you relieve a kidney stone attack? What about treatment? Find out what at-home and medical treatments doctors recommend to help control the intense pain—plus what doctors can do if a stubborn stone doesn’t pass. How can I prevent kidney stones? Drink enough fluids every day…eat a heart-healthy diet (that’s also good for your kidneys) …and, depending on blood tests, take stone-preventing medication. Get all the details in this informative resource. Does it matter what KIND of kidney stone I have? Yes! Knowing what your stone is made of can help you avoid a repeat incident. Harvard Medical School docs show you how. What to Do About Kidney Stones is the convenient, one-stop online source for the answers you need to claim victory over this painful condition. Symptoms: Why does it hurt so much? I’ve had one stone … now what? It’s likely that your pain will quickly get your attention and send you to the doctor or a hospital emergency department. They’ll ask about your medical history, which may affect your risk of kidney stones. You’ll also be asked about the type of pain you’re having, where it is, and how long you’ve had it. You’ll be asked to give a urine sample and likely have blood drawn as well. Often, imaging tests will be used to confirm if you have a kidney stone or not. If the pain is caused by a kidney stone, people tend to writhe and move, trying to find a comfortable position. In contrast, people with abdominal pain from other conditions (such as appendicitis) tend to stay motionless.